← Remember the AMC Pacer? Car carrier thief causes havoc on Australian toll road. 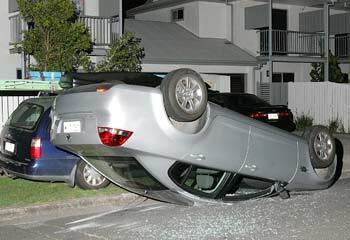 A THIEF driving a stolen car carrier left a trail of destruction as he sped through Brisbane’s northern suburbs – with one car ending up on its roof. The heavily-laden car carrier side-swiped at least six other cars during the escapade, and spilled vehicles from its load. The semi-trailer had been stolen about 8.15 at Eagle Farm. It was carrying several cars. The driver headed north on the Gateway Mwy, side-swiping six other cars. It then turned into quiet suburban streets around Nundah and Northgate. One car fell off the back of the truck and ended up on its roof when the carrier took a sharp corner too fast. The driver abandoned the car carrier in the front yard of a house in Ferguson St, Northgate, 2km away and fled. This entry was posted in Auto Transport and tagged accident. Bookmark the permalink.